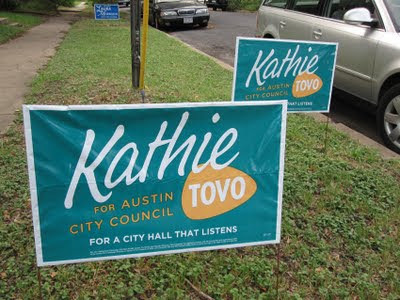 I'm a Tovo supporter... but... I can't get over those signs. Is it just me or does that ovoid shape look like the Pork logo? It's always too easy to criticize and I'm no stranger to the pitfalls of attempting novel graphic design. Maybe it's successful in the category of getting any attention is good attention. Maybe it's even a winning idea. It's eye catching, right? It's the reverse of the pork logo which means that she's against pork (e.g. excessive spending).